In the photo above you can see that Dynamic Productions had the right idea when they were planning an event at Avra Madison Estiatorio. They commissioned us for the black outdoor runner rug seen in the photo above. The event coordinators wanted to make a statement about the event at the entrance of this upscale Greek restaurant. The restaurant gets heavy pedestrian traffic because it is located near Central Park in New York City. 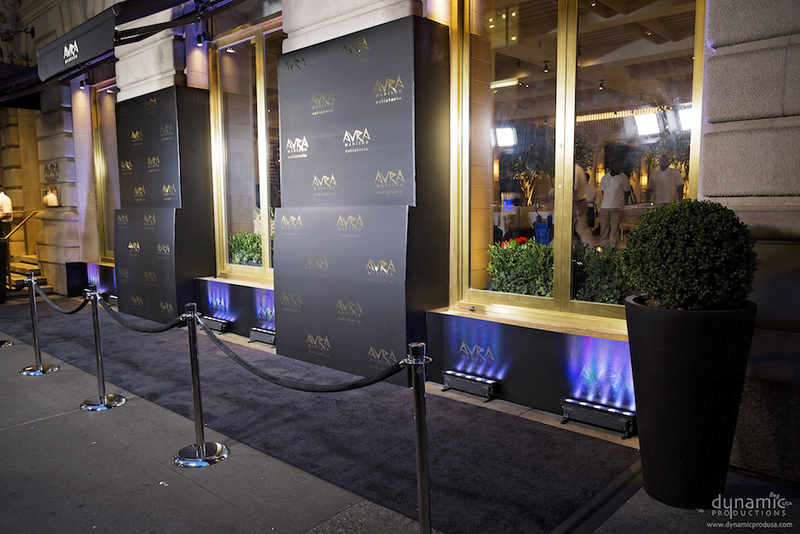 Dynamic Products used the aisle runner along with backdrops and rope stanchions to define the entrance to the event. Event runners can be created runners in more colors than you can imagine and themes or logos can be designed into the carpet. We work directly with individuals hosting a party, with party planners, event coordinators like Dynamic Productions, and with restaurants. If you’re looking for an outdoor runner for your restaurant event, check out our online shop or contact Event Rugs for custom orders.